The Padibed is a suplemental tool that will enable caregivers and healthcare workers to better supervise a patient who is in need of non-threatening care. The system can be incorporated into any setting giving a viewable access to Alzheimer's, dementia, or those with brain trauma or injuries. Some patients with these conditions require beds having additonal safety mechanisms. Patients in any of these categories can inadvertently harm themselves. 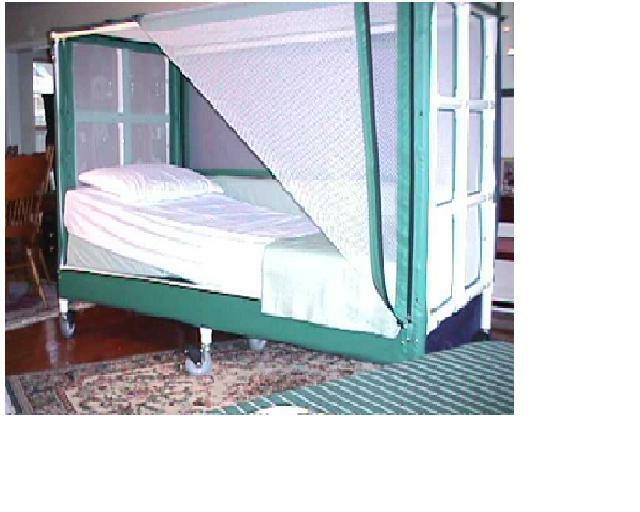 The bed can reduce or eliminate the use of medicinal or physical restraints which can delay recovery, and which leaves the patient feeling vulnerable and frightened. The bed is made in different sizes to accomodate the adult as well as the pediatric person. It is a safe, stable and comfortable bedding system made of lightweight , durable PVC. It is easy to setup move and store. It extends upward with a canopy and zippered netting to prevent the patient from exiting the bed unintentionally. The netting is completely see through. The netting is removable on the sides for caregiver access. It has locking castors. This product has been approved by the FDA. Dear Buyer, I would also consider the opportunity to license the patent. The product has been marketed and sold to hospitals, rehab centers, pediatric centers, nursing homes and private home settings.. It is very economical to produce and ship. It was either delivered assembled or in panels with easy step by step setup instructions. There are no electronics on this product due to problems with sterilization and cleanliness. It could be cold sterilized and put back into use. It was made with furniture grade PVC and fire retardant materials in the bedding and padding. I feel there is a growing market of patients that will need a device such as this for their safety and independence. It was designed with patient safety and comfort in mind. Our aging population will certainly dictate a need. Too many patients are lost each year due to unawareness of their safety needs. It is quite a lucrative product to sell, and was a very welcome alternative as to what else was available in the marketplace. There is a great concern over the use of restraints,, either physical or medicinal which inhibit rehabilitation of the patient. 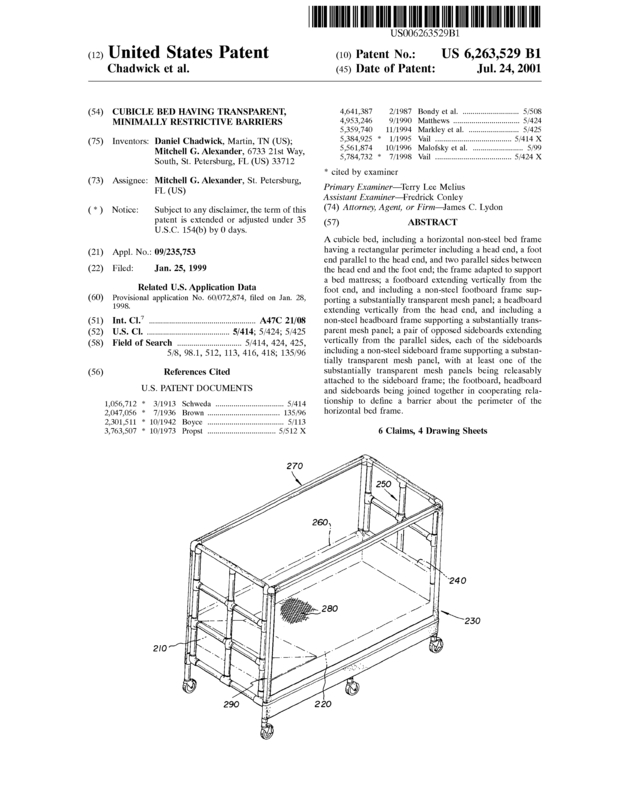 Page created at 2019-04-22 14:27:48, Patent Auction Time.